I'm planting my flowers this week! If you like junk gardening, follow along as I plant. A junk gardener cannot have TOO MANY galvanized buckets. 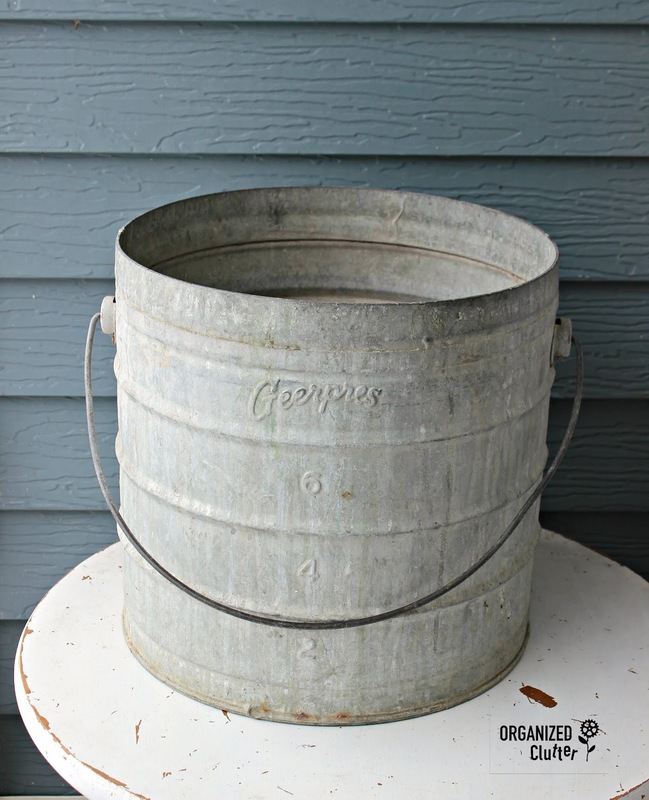 This bucket has been whitewashed with watered down Rust-Oleum American Accents Heirloom White and a chip brush. I used Ceramcoat Select Multi-Surface Paint in Black to stencil on the rooster. Ceramcoat Select is more durable outdoors than regular craft paint. I did two buckets with whitewash and rooster stencils. I purchased two matching hanging baskets at Kmart planted with Calliope Large Dark Red Geraniums, Dracaena Spikes , Bombay Dark Blue Improved Trailing Scaevola, and Bacopa. I purchased them at the beginning of May, and to honest they have not grown much yet. There is much more growing and blooming to come here. But this is what my rooster buckets look like at planting. Leafing out of trees still in progress here in northern Minnesota! We have mowed our lawn just once. I purchased this PANACEA PRODUCTS 5 gallon Grow Bag Herbs in April. I filled it with Miracle-Gro Moisture Control Potting Mix , and Burpee Thyme, Burpee Organic Sage, Burpee Italian Large Leaf Basil, Burpee Cilantro Organic Santo, and Bonnie Greek Oregano. Herb grow bag on planting day! I will share the bag's growth progress. Remember when I found this Geerpres bucket? 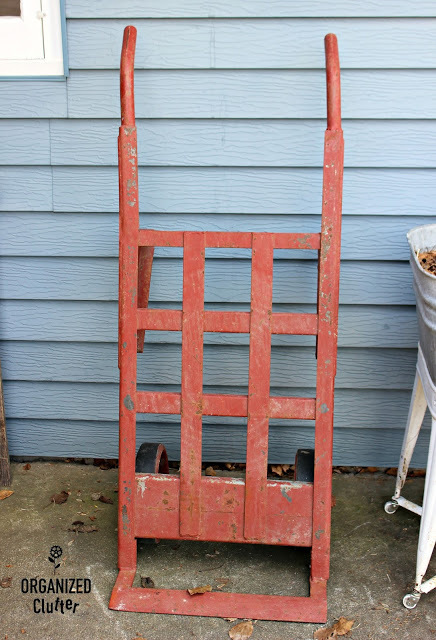 And this vintage red iron dolly? I will be displaying my Geerpres scrub bucket WITH the vintage red iron dolly I found in early May. I purchased this laundry tub and stand last fall. I stenciled "Wash, Dry Fold" from the FolkArt Die Cut Paper Stencils Phrases (26-Pack) and Ceramcoat Black Paint. I planted the washtub with four zonal red geraniums that I purchased from Menards. Two Sunsatia Cranberry (Nemesia) Live Plant, Red Flowers and Burpee Early Spring Heat Tolerant Dark Blue Lobelia. Nemesia are an underused annual, that is easy care and beautiful. My barn door planter/sign/tool holder from 2017 is planted with two Lanai Red 07 Verbenas and one White Knight Alyssum. Besides the Herb Bag Planter, I have a white enamelware coffee pot planted with another red nemesia with an Early Spring White Lobelia. Just using my iphone for planting photos. The potting bench area is starting to come together. Starting to plant all my garden junk too, although very cold here in NW Indiana - finally warming up again this next few days!! always enjoy your gardening details so i can see them flourish by summer's end. many great ideas! !